Ria and Takoda Ancient Relatives Hike Together Once Again! First Female Jamthund Born in Canada - Raven! Dagr checks out Tikka and Ark and Phoenix! Heads Up Everyone, There Is Moose Down There! Winter Conditioning Program In Full Swing! 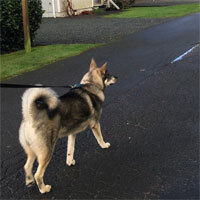 Takoda Watching Aina's Pups On The Trail! All The Best In 2019 From Kamia Kennels! Kamia's Kennels Young Jamthund Sire! Desna Training Program For Pups! 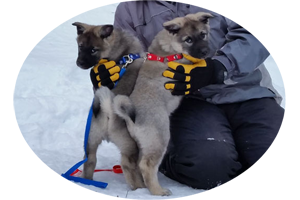 World Class Norwegian Elkhound Males! MANE and his daughter Tofa! MANE and his brother Teuvo, and Aunt Tuva! 14 Week Old Norwegian Elkhound Female! Two of the worlds best Norwegian Elkhounds! Two of the worlds best hiking Elkhounds! Two of our young future foundation females! Two of our world class foundation females! One of our top Stud Dogs, MANE! North America's Only Jämthund Breeder! There Is A Moose Out There! You Want Moose, We Can Get Moose! New Jamthund Pups Coming Soon! The Entire Lake Was Ours To Enjoy! 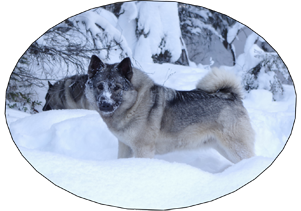 Please enjoy our latest newsletter on Norwegian Elkhounds and Swedish Elkhounds, it's a great article with a ton of pictures. You'll have lots of fun having an Elkhound puppy. Browse our page for available Elhound puppies for sale. 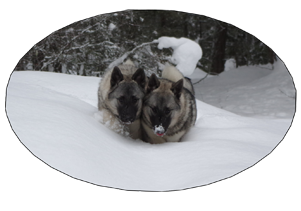 Welcome to our new Elkhound photo gallery landing page area. We are currently testing out a new style of gallery, we hope you like it. Check out Rico and Aina, Swedish Elkhounds, both are awesome young Jamthunds. We want to Thank You for visiting our online showroom for our Kennels and our Elkhounds, we truly appreciate it. 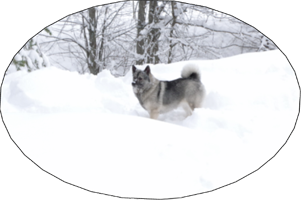 Our Latest Norwegian Elkhound Updates page is new, and features all our latest updates in an easy to access location. Please check it out. Our Kennel is now located just north of Grand Forks BC. We are so pleased with our new location, we welcome all of you to stop by, we have tons of room, it's a great place for dogs, especially Elkhounds, and we look forward to hearing from you. Now that we are so close to the border we have a lot of pups going to the USA families. If your from the US please touch base with us, we can fill you in on the border details. Our new location is an awesome facility with tons of room to hiking and condition our dogs. We are at a fairly high elevation and get a ton of snow. We live in a mountain home and the dogs can have tons of space to move and roam and play. We welcome you to stop by and visit. 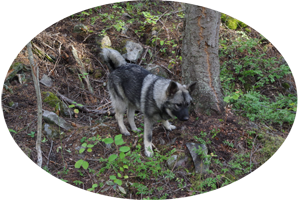 Learn more about the Norwegian Elkhound here. 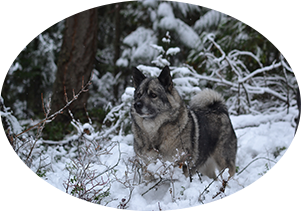 The Norwegian Elkhound, an ancient breed with history dating back thousands of years, is a powerful, dominant and loyal companion for any family. ...& excellent as watch dogs! Great Puppies Are On The Way! Mia has had a huge impact on our breeding program. She brings that stout thickness the breed is so well know for. But more importantly she brings the fertility from the ancient genetics. The old world females were very fertile, cycled on time, rebred, had big litters, were very healthy. 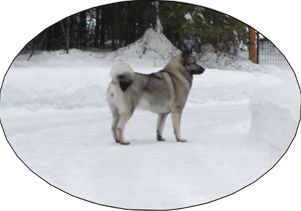 Takoda is one of the few big Swedish Elkhounds raised with full genetic instincts and instinctive actions and behaviours intact. Nothing has been trained out, we have allowed all his natural ability and instinct behaviour to flourish, exactly as it would have 400 or 1000 years ago. 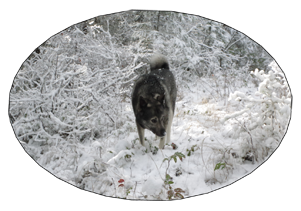 Tora, daughter of Mia and Takoda, foundation female of Kamia Kennels - we had four incredible litters out of Tora and Bram. 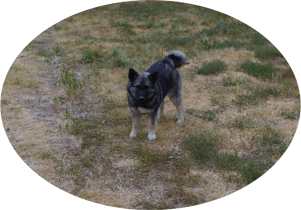 Tora is the most prolific female Elkhound there is. Tora is an amazing female. Tora has produced Kai for us, who will carry her genetics forward. MÂNE is a younger brother to Jaegar. 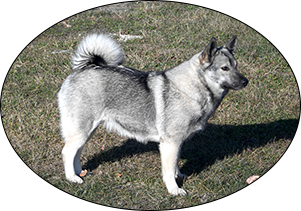 A spectacular young Norwegian Elkhound male from Takoda and Tekla. He has his first litter on the ground now in 2018 with Kalia and again soon in Jan with Kalia. Jaegar is a big fella, he is over 70 lbs all the time now, solid and thick. Jaegar is pulled all the dark old lineage traits from his ancient Swedish heritage, a stunning big male sire. Jaegar is the older brother to MÂNE. Kalia is a stunning big female. She is bringing the old Swedish genetics back into our female lineages. This is one of our young foundation females who we just had a great litter from with MÂNE and she is due again in January once more. Kamp is a big beautiful Norway female. She is the mother to our twins, Tekla and Tuva. Kamp is a solid very strong female at the upper range of size for Norway females, she is over 60 pounds. Kai is a tremendous young daughter of Tora. She is a granddaughter of Mia and Takoda. 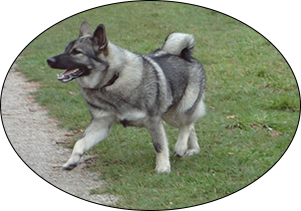 This is an awesome young female who displays all the instinctive traits of an ancient Elkhound. This is a very good female. These are the twins, Tekla and Tuva. 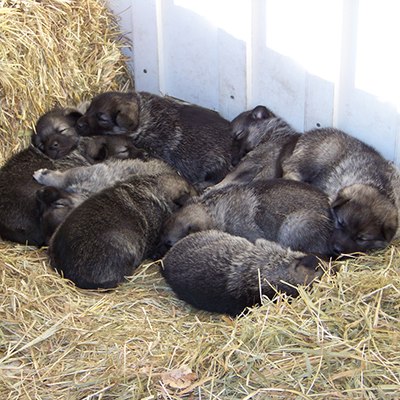 They are identical female Norwegian Elkhounds. They are daughters of Kamp, pictured to the left. These are stunning young females, two of the best in the world. 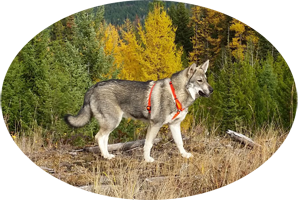 I just put a great article up about raising two Elkhounds. Leif is our new young Norwegian Elkhound Stud Dog. 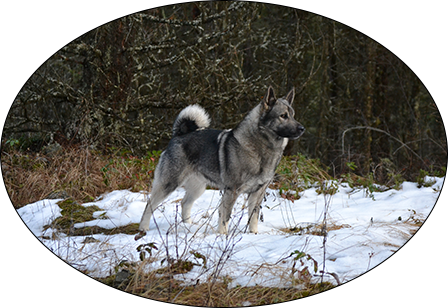 He is from a very long line of Grand Champion Norwegian Elkhounds. 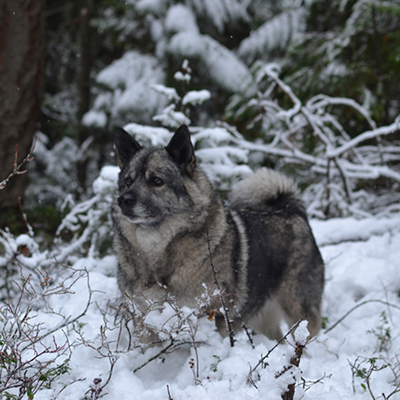 Leif will be used in our program with some of our top Norwegian Elkhound females, like Tuva and Tekla and Kai. Leif is going to have his first litter spring of 2017 with Tuva. MÅNE and Luna are the two tremendous young Elkhounds we kept back from the litter of Takoda and Tekla. MÅNE will be assisting Leif and Jaegar, and his dad Takoda with some of the breeding in the future. Luna will be taking over for her grandma Kamp in a few years and helping our her mother Tekla. 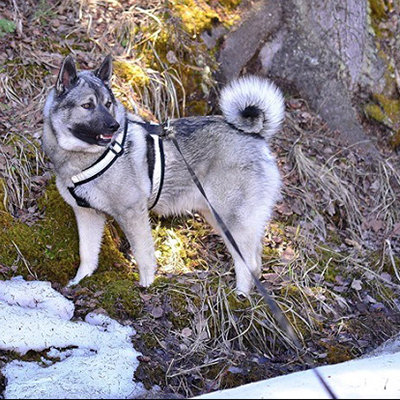 Aina is our beautiful Swedish Elkhound or Jamthund. Aina is a magnificent representation of the very best of the Jamthunds in the world. Every dog in her lineage is working Champion. Aina is the only full Jamthund breeding Female in North America. Phoenix is our magnificent young female from Kamp and Jaegar. She is going to carry forward the great lineage of Kamp, combined with her dad's genetics to be one of our foundation females. This is a clone of Jaegar through and through. Vida is the stunning dark daughter of Takoda and GÆDA. Vida will carry forward the ancient genetics from her mother and father. 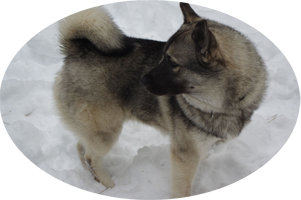 Both GÆDA and Takoda stem from the ancient Norrland / Swedish region Elkhounds and Vida will allow that to flourish. Maya is so full of life and energy! Ragnar is Doing Exceptionally Well! Aksel Is The Same Awesome Guy You Said He Would Be! Hi Merv, Now that we have land he has redeveloped more instinct and a leaner diet has him looking more trim! all the best, Michael and the Guy Family. Shaka is learning fast and extremely comfortable with his new surroundings! Hi Ashten it's Jordon, I just want to thank you and your father for everything you have done. The entire process was so professional, from your website, youtube channel, and e-mail communication. Shaka was well behaved in the air port and like you said he fell asleep as soon as the plane took off. I am so glad that I chose your kennel over the others in Alberta. Shaka is a great dog, he's learning fast, and is getting extreamly confortable with his new surroundings. I will provide pictures as soon as possible . Thanks again! Jordon Bernard . Vitnir on his first night home. Merv, Thanks so much for everything you’ve done. He has been an absolutely perfect dog, and it really shows that he came from a good breeder. Looking forward to many great years ahead with him and Tófa. Brent .